Great Grandma celebrating 100th birthday at the Ottawa Eagles. circa 1994. The best homework assignment I ever completed as a kid came from Mrs. McKee in 4th grade. The year was 1989 and fourth grade life was pretty simple. The Cubs won the division that year and the late Don Zimmer was Manager of the Year. (A bit of a stretch for this post, but as a Cubs fan, anytime we can tie in winning the Division, I plead it is fitting and acceptable to do so). The homework assignment was to interview someone who has lived a long time. We were learning history lessons in class and for the assignment, we were persuaded to ask a grandparent or someone of that particular age to give their perspective on a variety of questions. Topics like war and presidents, politics, transportation, cost of food, and voting. Looking back it was a very thought-provoking assignment and a good reminder to spend quality time with your grandparents, and if you’re fortunate enough, your great-grandparents. My subject: Great-Grandma Hoffman. She was undoubtedly qualified to answer my questions because she was easily the oldest person I knew in 1989. She was 95 years old. Because she spoke both high and low German, as well as English, I thought she might draw some extra credit points as well. No extra credit was necessary though; I learned more from that 90 minute conversation with my great-grandma than I ever learned in a text book that year. William McKinley, the 25th president of the USA was in office when Mary was born; November 22, 1894 to my great-great- grandparents, Joe and Lena Knott. During our interview she shared that the first president she remembered was Teddy Roosevelt who took office in 1901, when she was six years old. 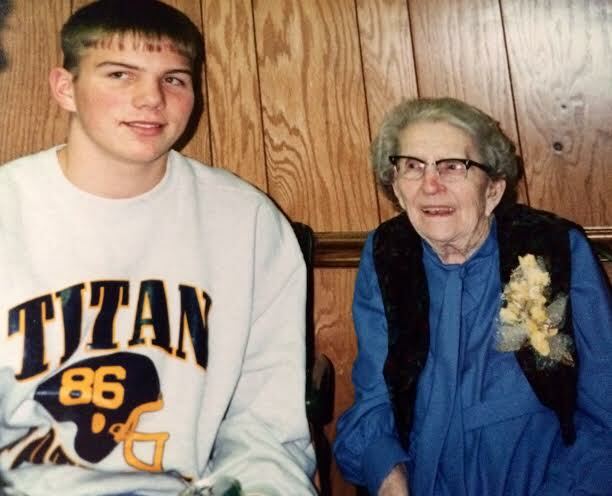 Great Grandma didn’t arrive to school in a yellow school bus. She traveled by horse and buggy most of her childhood and it wasn’t until she was “much older” that they got a car. Although they had a hit-and-miss engine on the farm, they didn’t have a car until she was out of school. In the marketing world, we talk about being remarkable, disruptive, and memorable so that a product stands out among its competition. When experiences are told or felt in the form of a story, and they are real stories told by people we know, research suggests we will remember them more clearly than if we do not know the person or more specifically, trust the person. That conversation with Great-Grandma happened nearly 30 years ago when I was just eleven years old, but I can still remember the blue dress with flower print she wore for the interview. I remember she sat where she always sat on the couch, next to the end table, where she kept her handheld radio, used for listening to Cincinnati Reds baseball games. Whether people are talking about a brand, or whether they are explaining what it was like to ride in a horse and buggy, people talking is what’s important, so we best listen. The people talking are not just consumers buying products, they are people teaching us a lesson.